Cathepsin K Inhibitor Screening Kit (ab185439) uses the ability of active Cathepsin K to cleave the synthetic AFC based peptide substrate torelease AFC, which can be easily quantified using a fluorometer or fluorescence microplate reader. 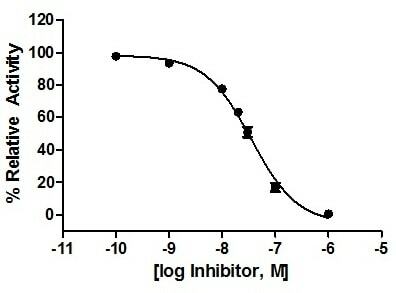 In the presence of a Cathepsin K-specific inhibitor, the cleavage of this substrate is reduced/abolished resulting in decrease or total loss of the AFC fluorescence. This simple and high-throughput adaptable assay kit can be used to screen/study/characterize potential inhibitors of Cathepsin K.
Cathepsin K (CTSK, EC 3.4.22.38), a lysosomal cysteine protease, is involved in osteoclastic bone remodeling and resorption. In addition, it also degrades collagen, gelatin and elastin. Cathepsin K is closely involved in osteoclastic bone resorption and may participate partially in the disorder of bone remodeling. Displays potent endoprotease activity against fibrinogen at acid pH. May play an important role in extracellular matrix degradation. Inhibition of Cathepsin K activity by Cathepsin K Inhibitor Screening Kit was performed following kit protocol. This is example data only. ab185439 has not yet been referenced specifically in any publications. Publishing research using ab185439? Please let us know so that we can cite the reference in this datasheet. There are currently no Customer reviews or Questions for ab185439.